Ambassador rejected calls for extra scrutiny of IDF behavior, emailed State Department officials to affirm Israel’s democratic standards. 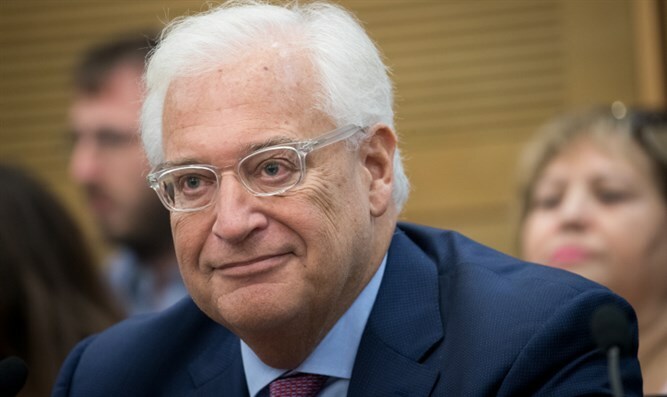 US Ambassador to Israel David Friedman pushed back against plans by the US State Department to enhance scrutiny of Israeli military behavior and potentially limit Israel’s access to American-made military equipment, a Politico report claims. According to the report published over the weekend, Friedman rejected calls for the application of new guidelines regarding the probing of foreign countries which benefit from US military aid, arguing that Israel’s adherence to democratic principles was never in doubt. The issue revolves around the application of a series of laws known collectively as the “Leahy Laws” or “Leahy Amendments”, after Vermont Democratic Senator Patrick Leahy. Under the laws, the US State Department and the Pentagon are restricted from providing aid to countries deemed to be in violation of basic human rights standards. While the Leahy Laws have not been used to deny Israel US funds in the past, in 2016, Senator Leahy and 10 other Democratic lawmakers urged the State Department to probe the IDF for possible “gross violations of human rights”. A February 2016 letter by the Democratic lawmakers called Israel’s use of force against terrorists “extrajudicial killings”, and demanded the State Department investigate whether Israel could continue receiving aid under the Leahy amendments. "In light of these reports we request that you act promptly to determine their credibility and whether they trigger the Leahy Law and, if so, take appropriate action called for under the law," the letter reads. In 2017, the State Department’s inspector general released a report criticizing US embassies in the Middle East for insufficient oversight regarding the use of US aid money by possible human rights violators, in particular the Egyptian government. The report called on all US missions in the Middle East to adopt a new set of guidelines including enhanced scrutiny of their host countries for possible human rights violations. Ambassador Friedman, however, denied Israel’s defensive actions required the more rigorous scrutiny called for by the department’s internal report, arguing that given Israel’s democratic system and history of addressing incidents of misconduct, existing guidelines for enforcement of the Leahy Laws were sufficient.